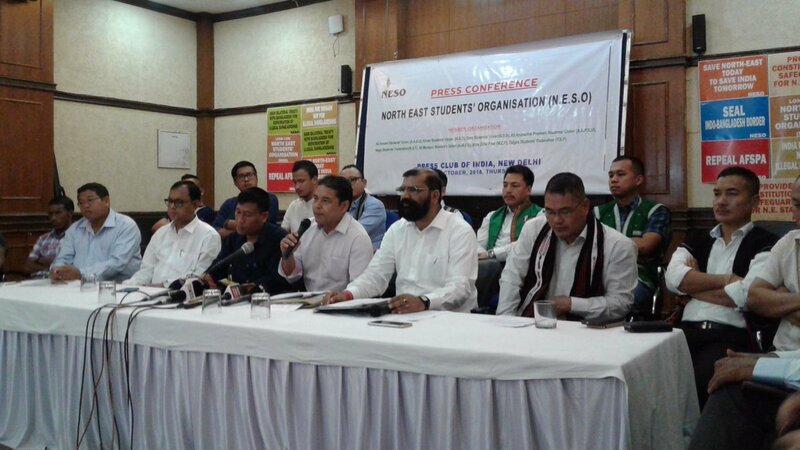 North East students organisation comprising of all students federation the body of the north-east, was in new Delhi and held a press conference narrating their demands to the Government of India through MHA, in their briefing to the media at Press Club of India, in New Delhi today. Manipur has porous borders, which works easy conduit, infiltration of arms, drugs and even human takes place from Bangladesh and Myanmar to Manipur. More than 300 kilometers of Indo-Myanmar border is open, India and Myanmar should have a strategy to keep a tab on cross border movements and there should be identified border line between the two counties. The North East Students’ Organisation (NESO) Thursday urged the Centre to implement the National Register of Citizens (NRC) in the entire region to detect and deport the illegal immigrants living there. Implementation of National Register of Citizen (NRC) in the entire northeastern States and withdrawal of the Citizenship (Amendment) Bill 2016 were amongst the eight demands raised by a delegation of North East Students’ Organization (NESO) on Wednesday to Union Home Minister Rajnath Singh. The delegation also met Minister of State for Home Kiren Rijiju separately in New Delhi and registered their protest against the controversial Citizenship (Amendment) Bill 2016. NESO has submitted to the Ministry of home affairs their a memorandum highlighting eight burning issues of this landlocked region. India's borders with Bangladesh, Myanmar and Bhutan highlights the porous nature of these borders, which pass through difficult terrain of forest, rivers and mountains and make the task of guarding all the more challenging. The need for guarding these boundaries along Indo-Bangladesh border, in sight from the mid 1980s. Fencing of the Bangladesh border was then commissioned as a potential mechanism of defending the peace and tranquility of the North Eastern states which until today has lingered nearly forty years in abysmal. Delhi for sponsoring the research project on the Problems of Border Areas in North East India has made several pointed deliberations on the subject. Special Constitutional status and separate Time zone for NE regions.